Eunice Kennedy Shriver's Olympic Legacy At 85, Eunice Shriver, founder of the Special Olympics, is still working tirelessly to open opportunities to people with mental retardation. In 40 years, the games have grown to reach 2.25 million people in 160 countries. Shriver has been a lifelong advocate for people with mental retardation; she founded the Special Olympics in 1968. Above, Shriver stands with athletes in South Africa in 2002. When Eunice Shriver was growing up — the middle child in her famous family — she developed a passion for competition and sports. "I was always trying to find my brothers, not my sisters," she says. "I wanted to play football, and I was very good. I was always the quarterback." Those football-playing brothers included Jack and Bobby Kennedy. Shriver's love of sports led her to later start the Special Olympics, which gave people with mental retardation the opportunity for athletic competition. Today, Shriver is still working — every day — as an advocate for people with mental retardation. Shriver walks gingerly down the marble halls of a Capitol office building, holding onto the arm offered by her son, Tim Shriver. She's a pencil-thin woman, in a camel-hair coat with a fur collar. She walks into an office to meet Sen. Tom Harkin (D-IA). Shriver quickly takes off her watch and puts it on the table, to keep the meeting short. It's also a friendly warning for Tim; he runs Special Olympics now. "She's already telling me we have to end the meeting," Tim Shriver jokes to the senator. "We haven't even started yet." "You're on a stopwatch," Harkin replies. Harkin is a long-time supporter. It's a busy day, but he meets with the Shrivers for 15 minutes. The Shrivers and their delegation are on Capitol Hill to seek several million dollars to expand health care and other programs run by Special Olympics. Eunice Shriver was the fifth of nine Kennedy children. Edward (from left), Jeanne, Robert, Patricia, Eunice, Kathleen, Rosemary and John stand with their parents, Rose and Joseph Patrick Kennedy, in London in 1937. 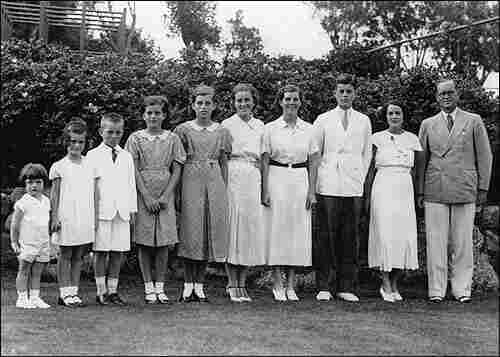 Not pictured is the eldest Kennedy child, Joseph Patrick Jr.
No family has done more than the Kennedys to change negative attitudes about mental retardation. Back when having a family member with retardation was a source of secrecy and shame, President John Kennedy, in 1962, spoke of his family's own experience. One of the Kennedy children, Rosemary, was born with mild mental retardation. "Those of us who have seen children live in the shadow [of mental retardation]," he said, "know that a country as rich as ours can't possibly justify this neglect." 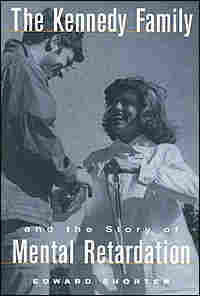 President Kennedy set up research centers on mental retardation. Robert Kennedy inspected squalid state mental institutions. Sen. Ted Kennedy (D-MA) helped write the Americans with Disabilities Act. 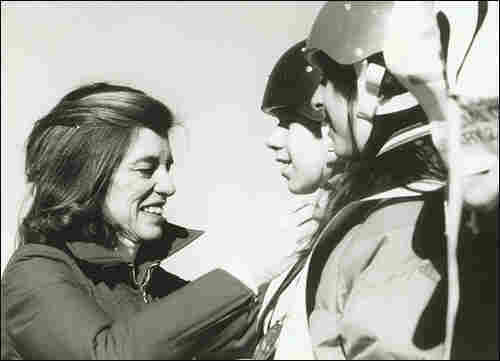 And it was Eunice Kennedy Shriver who was always on the phone nagging her more famous brothers to take action. "I had enormous affection for Rosie," Shriver says. "If I [had] never met Rosemary, never known anything about handicapped children, how would I have ever found out? Because nobody accepted them anyplace." Rosemary's disability worsened after she had a lobotomy, an operation that was meant to help her. She spent most of her life at a private institution in Wisconsin and died in 2005. Eunice Shriver visited regularly and made mental retardation a constant cause. 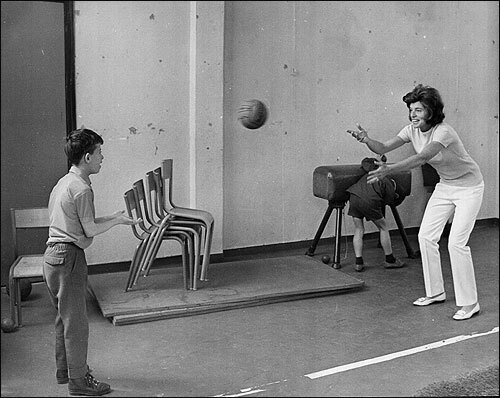 Above, Shriver and a child play catch in Paris in preparation for the 1970 games. Today, the Special Olympics includes more than 2.25 million people in 160 countries. "Eunice is a remarkable woman," says history professor Edward Shorter, author of The Kennedy Family and the Story of Mental Retardation. "It was extraordinary of her to conceive that she, too, could play a role comparable to that of her brothers," Shorter says. "Her leadership role would be in the area of mental retardation rather than on the big political stage, because in the 1950s, she couldn't get on that political stage. Women weren't tolerated there." Shriver saw that just as political roles were limited for her, many more opportunities were limited for people with mental retardation. Shorter says she rejected the role of society woman and took over the family foundation. "She had the genius to see that she, in fact, was capable of major achievements helping these kids, and that's what she did. She dedicated her life to it," says Shorter. She also opened her home. In 1962, an exhausted mother got Shriver on the phone. The woman wanted to know what to do because no summer camp would accept her child with mental retardation. 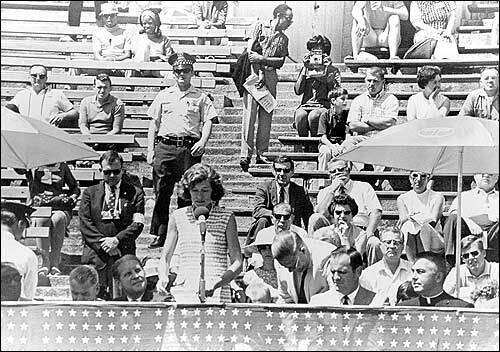 Shriver speaks at the first Special Olympics Games in Chicago in 1968. She told the athletes, "In ancient Rome, the gladiators went into the arena with these words on their lips: 'Let me win. But if I cannot win, let me be brave in the attempt.' Let us begin the Olympics." "I said, 'You don't have to talk about it anymore. You come here a month from today. I'll start my own camp. No charge to go into the camp, but you have to get your kid here, and you have to come and pick your kid up.' [I] said, 'Thanks very much,' and I hung up the phone." For years, Eunice Shriver ran that summer camp — for no charge — at Timberlawn, the family estate in Maryland. She would get in the pool and teach kids to swim. Her own children — Robert, Maria, Tim, Mark and Anthony — were just little kids in those days. "Talk to Timmy," says Shriver, "[He'll] tell you horror stories about how they were left in the house and nobody to play with because [I] was out teaching swimming." There were scores of noisy campers, counselors, horses, soccer games and obstacle courses. Lyndon Johnson came once. Robert McNamara, too. Tim Shriver says Camp Shriver--for all its chaos--is a big reason all his siblings stay involved in the issue. "The great gift that we had as kids," Tim Shriver says, "was never to be introduced to disability or intellectual disability as a cause but more as an activity. Never as a burden, but rather as a joy. Our introduction to people with special needs was to swim or to play kickball or to go horseback riding. Part of her genius [has] always been to create things that are appealing, create opportunities that are joyful that people want to join, that make things fun." Shriver awards medals to athletes at the 1968 games. 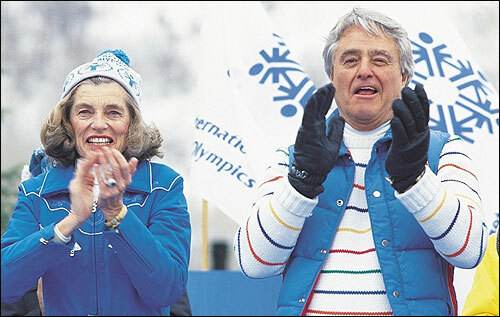 That summer camp led Eunice Shriver and her husband, Sargent, to start the Special Olympics. Eunice Shriver opened the first national games. It was the summer of 1968, in Chicago, just weeks after the assassination of Robert Kennedy and before the riotous Democratic convention. "In ancient Rome, the gladiators went into the arena with these words on their lips," Shriver told the athletes, "Let me win. But if I cannot win, let me be brave in the attempt. Let us begin the Olympics." What began that year has grown. The 2007 World Games will be held in Shanghai. 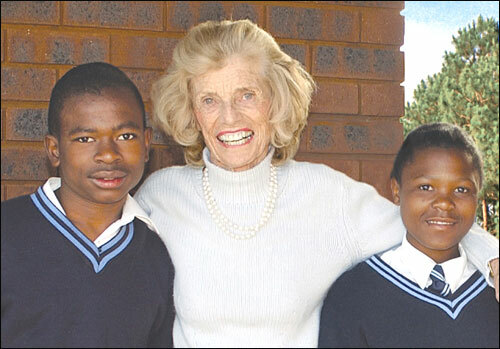 Eunice Shriver plans to be there, along with athletes from 160 countries. In recent years, she hasn't always been on the cutting edge of issues. Other advocates and her sons pushed to make Special Olympics more than a once-a-year sporting event. It's now a place where participants get linked to health care and community programs and start lasting friendships. At 85--rich and accomplished--she could retire or go on glamorous vacations. Shriver and her husband, Robert Sargent Shriver Jr., applaud athletes at the Third International Special Olympics held in Park City, Utah, in 1985. But don't try telling Eunice Shriver to relax. When asked why she continues to work so tirelessly on the issue she replies: "Because it's so outrageous, still. In so many countries. They're not accepted in the schools. They're not accepted in play programs. They're just not accepted. So we have much to do." And so Shriver keeps at it. The same week she lobbied senators for Special Olympics, Shriver also went to a congressional hearing and a gathering of governors. She met with the secretary of education and then with college presidents--to ask for education programs after high school. Every year, Shriver brings a parent of a disabled child and someone who works in disabilities to Washington. They work on Capitol Hill for the year, then most go back to their states, where they have become a new generation of leaders. Earlier this month, more than three dozen former Kennedy Fellows gathered in the ballroom of a Washington hotel to hold their first-ever reunion. There was a sense in the room that this might be a last chance to honor Shriver. She has been hospitalized several times; two years ago she had a small stroke. At 85, Shriver is still actively working as an advocate for people with mental retardation. Above, she sits with a baseball team at the 2006 Special Olympics Summer Games in Ames, Ia. Shriver stepped carefully to the podium. When she got there, she made clear that she will keep fighting for people with intellectual disabilities. "We've got to be so proud of what our special friends do and their future," said Shriver, "Their possibility of really bringing to the world something that really resembles peace and hope and faith and love that's what they can do. And we're so proud of them. And we want to keep going all the time, the next 20 years. I'm going. You come with me?" The ideas, the essence of the vision, came from Eunice. First of all, why was she so drawn to the Special Olympics, as opposed to any of the other vehicles for helping the mentally retarded that came along? It was partly because of her own tropism toward athletics. As Sarge said, "If Eunice hadn't been a sportswoman, she wouldn't have thought of the Special Olympics." Also, she was more at ease with athletes than with scientists. According to Donald Stedman, "She felt very uncertain standing up there talking about chromosomes. [Sports] was something she felt that she could talk about and feel comfortable. She was very uncomfortable with neurologists, psychiatrists, and the rest, although she knew she needed them. She would tell me that. I could tell. I'm a psychologist. I could see how pained she was." Why did she admire athletes so much? As Stedman said, "She admired them for their endurance. She's a long-distance runner herself in a metaphorical sense. She liked gutting it out, excellence of that type. She's not anti-intellectual, but she put a big premium on performance." It does seem to be true that Eunice felt a physical resonance with athletics, with events that challenged the body, an inheritance of decades of swimming and sailing at the Cape and of touch football on the back meadow at Timberlawn. But Eunice had one more deep psychological wellspring. It was a quality that knocks awry the vicious media image of the Kennedy family as elitist and patrician. Eunice Shriver was very much a democrat. Having no patience with the voluptuousness of the rich, she herself lived almost ascetically and brought up her children in a materially rather tightfisted household. (Anthony and Bobby Shriver, at least, believed themselves continually short of cash. Anthony, circa age eleven, once reproached the much older Bobby: "I feel ... that you place too much emphasis on money. I do realize that neither one of us have very much money ... I suppose I should not entertain myself in the same manner you do, because I am so much younger and have less money. Thus Eunice made the Shriver home a household like all the others (except for being a little larger), shunning the imperial aura with which her father had surrounded himself. "Eunice had this kind of common touch," said Stedman. "It's an interesting contrast. On the one side, she's a Brahmin, a very high–toned person, but she had this populist sense that the Olympics allowed her to play out ... It would be something that everybody could have and everybody could participate in." As Eunice said at one point, Special Olympics teaches "that all human beings are created equal in the sense that each has the capacity and a hunger for moral excellence, for courage, for friendship and for love. Whatever the speed of our feet or the power of our arms, each of us is capable of these highest virtues. Intelligence does not limit love, nor does wealth produce friendship." It was this quality of populism that led Eunice to the core of her vision of the Special Olympics-that through sports not only do we help the mentally retarded, but they also help us. She constantly emphasized growth: we grow as we help those with mental retardation grow. Only somebody intently attuned to the lives of the parents and their suffering would have understood that the Special Olympics was not just a classical act of noblesse oblige, handing something down patronizingly to the suffering poor, but of self-help as well. 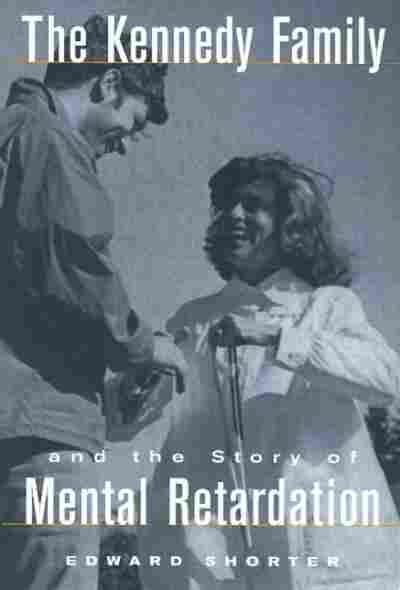 Excerpted from The Kennedy Family and the Story of Mental Retardation by Edward Shorter. Copyright ©2000 by Temple University. Used by permission of Temple University Press.